Motorola Moto E has no hardware controls at the front, you control everything with the on-screen controls provided by Android. The earpiece and the loudspeaker are both flanking the display, protected by glossy silver bars. The proximity and ambient light sensors are also around. Note that the primary microphone is also hidden below the bottom silver plastic element. The right side of the Moto E houses the power/lock key and the volume rocker, both made from glossy silver plastic. There is nothing on the left. The 3.5mm audio jack and the secondary noise-cancelling microphone are on top of the Moto E, while the bottom has the lonely microUSB slot. The centered 5MP fixed-focus camera lens is at the back accompanied by the Motorola's logo. Removing the battery cover, which is a bit of a hassle and fingernail work, reveals the microSIM and microSD slots. You can hot-swap the microSD card anytime. 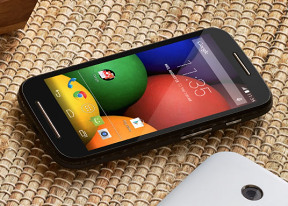 The Moto E features a 1,980mAh battery, but Motorola didn't specify how long it is expected to last. The capacity isn't too big, but given the efficient chipset and relatively small screen, we were quite optimistic about its prospects. The Motorola Moto E had below average power draw on stand-by, but did well on the rest of our tests. This helped it to a final endurance rating of 60 hours, which means the Moto E will last exactly two and a half days if you do an hour of calls, an hour of video watching and an hour of web browsing each day. 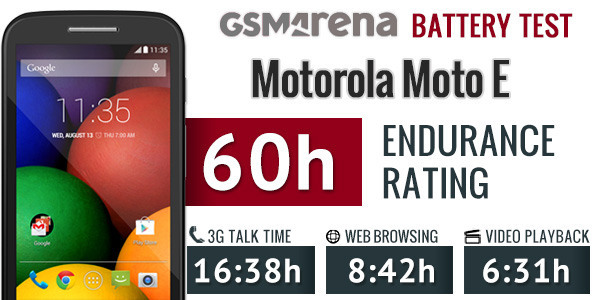 For a more detailed breakdown of the Motorola Moto E battery performance check out our blogpost. The dual-SIM-enabled Moto E supports dual stand-by, but does not support dual call. This means that once you get a call on any of the SIM cards, the other one becomes inaccessible for the duration of the call. One particular connectivity feature is reserved only for the XT1025 dual-SIM Moto E - Digital TV. This model is strictly limited to very few markets though so we guess the supported Digital TV standard is tailored to the services available in these markets only. The rest of the connectivity features available across all models include single-band Wi-Fi b/g/n and Wi-Fi hotspot. There is also support for Bluetooth 4.0, GPS and GLONASS, plus an FM radio with RDS. There is a microUSB 2.0 port for charging and data connections. Media transfer mode is supported for accessing the phone's built-in memory and microSD card over the USB cable. The Moto E doesn't support USB OTG. The microUSB port doesn't have any TV-out functionality, but if own a compatible HDTV, you can output your phone's screen wirelessly via the Miracast protocol.